There have been several books about the many film appearances of Sherlock Holmes, and almost as many about the various television adaptations, but few have so concisely consolidated the two as Alan Barnes' excellent guide Sherlock Holmes on Screen. Barnes' book is perhaps the first to give equal weight to the TV series and movies, and certainly the first whose entries on the Peter Cushing, Douglas Wilmer and Richard Roxburgh TV portrayals (for example) are as detailed as those on the Granada Television series, which starred Jeremy Brett. The Brett series is widely regarded as the best adaptation, and it introduced many people to the character who would go on to be long-term fans, but it also tends to eclipse other adaptations which are equally worthy of close study. At a smidgeon under three hundred pages, nothing is covered in any great depth, of course, but the book offers a good overview of each production, together with a discussion of its merits. Each entry is accompanied by a cast list, and basic production details. The reviews also note where they deviate from the canonical Conan Doyle stories. 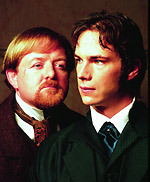 The book covers all live-action productions featuring the character (including episodes of series like Star Trek - The Next Generation, which feature one of the Holmes characters). Excluded are comedy sketches and animated films, (something we should perhaps be grateful for, given the almost uniformly awful quality of such endeavours). The book is full of interesting information, especially about productions which have not been scrutinised before, such as the series of Russian TV adaptations made between 1979 and 1986, which were generally untainted by influences inherited from generations of previous adaptations. Navigating the book presents the casual reader with quite a problem. The book is arranged alphabetically, which, naturally means that there are clumps of entries with similar titles (particularly around "Sherlock..." and the canonical titles, "Hound..." and "Sign of...", for example). Perhaps in recognition of this the author has seemingly bent over backwards to differentiate titles. Some entries are listed by their foreign language titles; others are to be found under the umbrella title of a particular series of plays, which might not be immediately obvious to many readers. A case in point is a 1951 BBC series, which is listed under the rather tortuous title We Present Alan Wheatley As Mr Sherlock Holmes In... It's a shame that the book has not been given a comprehensive index: at least one other Reynolds & Hearn publication (David Miller's equally indispensable The Peter Cushing Companion) gained one between its first and second editions. Instead, a chronology is offered, but even that doesn't offer the obviously-useful addition of the relevant page numbers for each entry. Having established its bona fides as a worthwhile addition to the bookshelves of anyone interested in Sherlock Holmes, or to those interested in vintage film and television, let's look at what the second edition offers by way of incentive to upgrade from the first edition. The most notable change is that the new version is a hardback. Reynolds & Hearn have produced many fine books for their niche markets, but relatively few of them have been offered in this format, which is a shame. The new edition of Sherlock Holmes on Screen comes with a new jacket design showcasing Basil Rathbone as Holmes, instead of Peter Cushing, who featured on the cover of the first edition. Beneath the jacket is a plain black volume with gold embossed lettering on the spine. The new edition is about sixty pages longer than the first. Some of this can be attributed to a different layout, one where many photo's have been enlarged. There are, however, a significant amount of new additions. Some, like two recent TV movies starring Max Headroom's Matt Frewer (The Case of the Whitechapel Vampire and The Royal Scandal) have been released since the book was originally published, in 2002. The most significant addition is arguably the one for the BBC's frankly insultng adaptation of The Hound of the Baskervilles, which starred Richard Roxburgh. Other new entries include an overlooked 1976 NBC pastiche, The Return of the World's Greatest Detective, which featured Larry Hagman as Sherman Holmes; the misguided 2002 TV movie Sherlock (a.k.a. Sherlock: Case of Evil); and the recent Hollywood blockbuster The League of Extraordinary Gentlemen, which featured Roxburgh, again, this time as Professor Moriarty. It's in this review that Barnes' offers the sobering observation that there hasn't been a theatrically-released Sherlock Holmes film since Young Sherlock Holmes, eighteen years ago. It's astonishing to think that such a fertile property has been ignored for so long, apparently no longer likely to draw a cinema audience. There are about a dozen new photo's in the second edition, featuring everyone from Tom Baker, in the BBC's 1982 version of The Hound of the Baskervilles, to Arthur Wontner in 1932's The Missing Rembrandt. Most are new additions, but a few have replaced less impressive ones. The reproduction of the photo's in the new edition seems slightly better, with improved contrast and density. There are some subtle improvements in the book's layout. Little has changed, but some photo's are now placed closer to their respective entries in the text, and there are a few other minor tweaks to the position of the captions. Sherlock Holmes on Screen is a book you'll probably find yourself referring to regularly. The second edition is a substantial improvement on the first, and should offer enough incentives for those who have well-thumbed copies of the 2002 edition to upgrade. The book is currently listed by Amazon (at £13.99, a saving of £6 on the publisher's list price of £19.99), but it's not easily found, because Amazon has botched the title. Click here, or on the sleeve image, above, to see Amazon's listing - and support Zeta Minor by using our affiliate link!